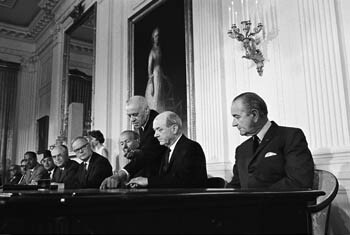 President Lyndon Johnson looking on as Secretary of State Dean Rusk prepares to sign the NPT, 1 July 1968. Forty-five years ago today, the United States, the Soviet Union, the United Kingdom, and dozens of other countries signed the nuclear Nonproliferation Treaty (NPT) at ceremonies in Washington, Moscow, and London. Forty-five years later, nearly 190 countries have signed and ratified the treaty, which seeks to prevent the spread of nuclear weapons to prompt the reduction and eventual elimination of all nuclear weapons. As the late NPT negotiator, George Bunn wrote in a 2008 article looking back on the evolution of the treaty in Arms Control Today, “the NPT has been the primary rule-maker that has prevented the spread of nuclear weapons around the world,” but it is at a crossroads that demands U.S. and global leadership. On May 28, 2010, the NPT states parties reached consensus at the NPT Review Conference on an action plan designed to strengthen and update the treaty, including, for the first time in 15 years, steps toward establishing a zone free of weapons of mass destruction (WMD) in the Middle East. The 2010 action plan is centered on a series of 64 action steps aimed at strengthening the treaty’s “three pillars” of nuclear disarmament, nonproliferation, and the peaceful uses of nuclear energy. On the Middle East zone, the parties agreed to start a process over the next two years to determine how progress can be made on a WMD-free Middle East, in particular calling for a regional conference to discuss the issue in 2012. Since then, however, the Middle East zone meeting has not yet taken place and progress on key nuclear disarmament objectives remains stymied. As I argued in an earlier essay in Arms Control Today in October 2012, the nuclear non-proliferation system must be updated in order to remain effective, states must comply with their solemn treaty commitments, and progress on nuclear disarmament must be accelerated. Even with the NPT in place, political and military tensions continue to drive proliferation behavior in regional hot spots. If U.S.-led talks with Iran and North Korea fail to persuade them to curb sensitive nuclear fuel-cycle activities and meet their nonproliferation obligations, the risk of arms races and conflicts will grow. The nuclear-armed states who never joined the NPT—India, Israel, and Pakistan—must not allowed to be bystanders. They must adhere to the same nuclear disarmament measures expected of the NPT member states. Reduce Global Arsenals. President Obama’s June 19 call for a further “one-third” reduction in U.S. and Russian deployed strategic arsenals and “bold” reductions in tactical nuclear stockpiles in Europe is welcome and overdue. If the two sides can agree to accelerate reductions and cut their forces below the 1,550 warhead ceiling of the New Strategic Arms Reduction Treaty (New START), both sides reduce their planned spending on nuclear force modernization by tens of billions of dollars. With New START verification tools in place, reciprocal U.S.-Russian cuts, including new transparency measures on tactical nuclear weapons, need not wait for a new, follow-on treaty. Such actions would put pressure on China to abandon its slow increase in nuclear forces and open the door for serious multilateral disarmament discussions. Prevent a Nuclear-Armed Iran. Tehran has not yet made a decision to build nuclear weapons and does not have the necessary ingredients for an effective nuclear arsenal. Preventive military strikes would be counterproductive; sanctions can alter Iran’s calculus, but cannot halt its program. The White House needs to redouble the efforts of the P5+1 group to achieve a diplomatic breakthrough with Iran’s new president Hassan Rouhani to limit Iran’s enrichment to normal reactor-grade levels, cap its uranium stockpiles, and give international inspectors greater access to ensure that Iran has halted all weapons-related work, all in exchange for a phased rollback of international sanctions. Freeze North Korea’s Nuclear and Missile Buildup. North Korea’s third nuclear test conducted on Feb. 12, 2013 has undoubtedly taken it one step closer to possessing a missile-deliverable nuclear warhead. If its nuclear and missile programs continue unchecked, North Korea could amass a larger and more deadly nuclear arsenal in the next few years. This could pose a much more significant threat to the region, embolden Pyongyang to take greater risks, prompt counteractions by South Korea and Japan, and increase the risk that Pyongyang sells fissile material to another country or to terrorists in exchange for much-needed hard currency. The seriousness of the problem requires that the United States needs to coordinate policy with other stakeholders in the region and rejuvenate U.S.-led diplomacy designed to freeze and reverse Pyongyang’s nuclear and missile programs. Although North Korea’s leaders might not, for now, be willing to negotiate away their nuclear weapons program altogether, they still appear to be willing to abandon portions of it in exchange for improved relations with the United States, a formal end to the Korean War, and the possibility of much-needed energy and economic support. U.S.-led negotiations, combined with stronger Chinese pressure on the North, could bring a halt to further nuclear and missile tests. End Testing Forever. Twenty years after its last nuclear test, the United States no longer needs or wants a resumption of testing. Yet by failing to ratify the Comprehensive Test Ban Treaty (CTBT), Washington has denied itself and others the treaty’s full security benefits. With the CTBT in force, the established nuclear-weapon states would not be able to proof-test new nuclear warhead designs, newer nuclear nations would find it far more difficult to build more-advanced warhead types, and emerging nuclear states would encounter greater obstacles in fielding a reliable arsenal. The CTBT can help head off future nuclear arms competition, particularly in the Middle East, South Asia, and the Korean peninsula. President Obama needs to follow through on his June 19 pledge to pursue Senate approval of the CTBT through a New START-like ratification campaign. Secure Nuclear Material. Today, dozens of states possess nuclear material that must be safeguarded from terrorists. Recent nuclear security summits have prompted significant action, but as a new Arms Control Association/Partnership for Global Security report finds, there are gaps in the global nuclear materials security regime and many states must maintain and improve their performance. Consistent funding and U.S. leadership on a long-term, global framework for action are also critical. New efforts to end the production of fissile material, particularly by India and Pakistan, are also essential. To help achieve a global cutoff treaty, the five original nuclear powers could formalize their de facto production halt and engage Islamabad and New Delhi in direct talks to curtail their fissile production. None of these steps can be achieved easily or quickly. But then again, the NPT and today’s nonproliferation system were not built in a day. The work necessary to curb the spread and to prevent the use of nuclear weapons must continue. This entry was posted in China, CTBT, Fissile Material Cutoff Treaty, India, Middle East, Missile Technology, New START, Non-proliferation, North Korea, Nuclear Energy, Nuclear Security, Nuclear Weapons, Pakistan, Russia, Tactical Nuclear Weapons. Bookmark the permalink.